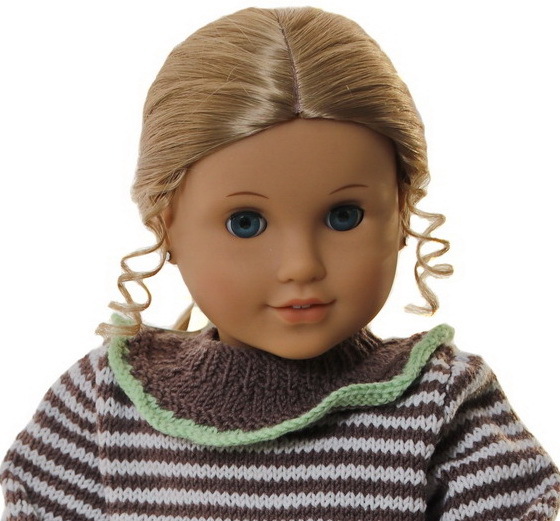 Your doll will look so lovely in these beautiful new clothes. 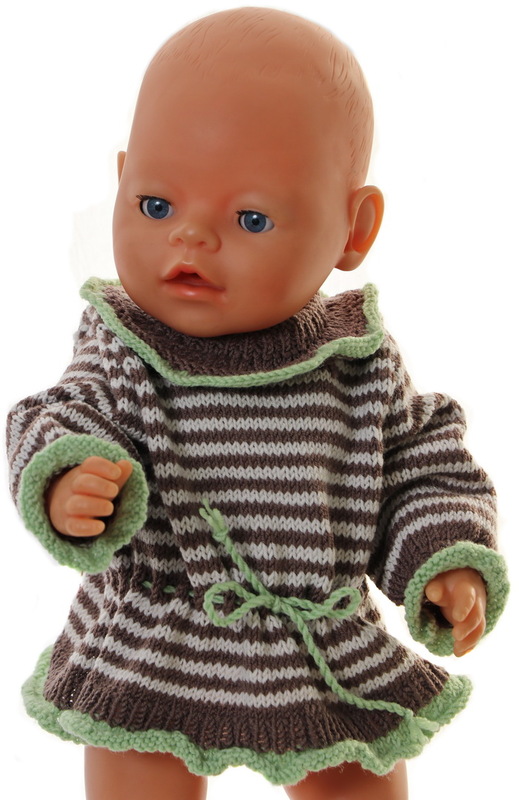 When your friends see how special your doll is I am sure they will want to knit the same for own doll!. 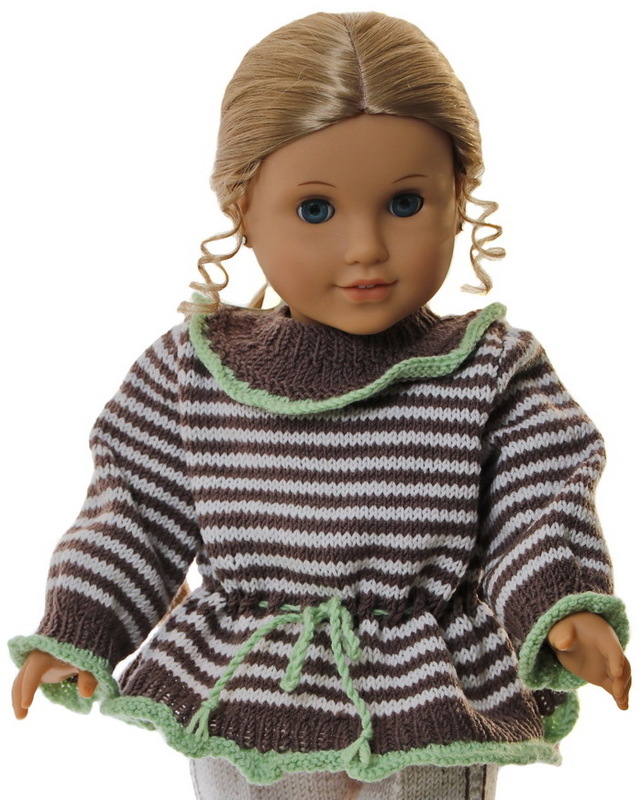 I have always liked clothes with stripes, and knitted in beige and brown always look good. However, I thought some wrinkled edges in another collar would make it look more special. I choose green for these edges. 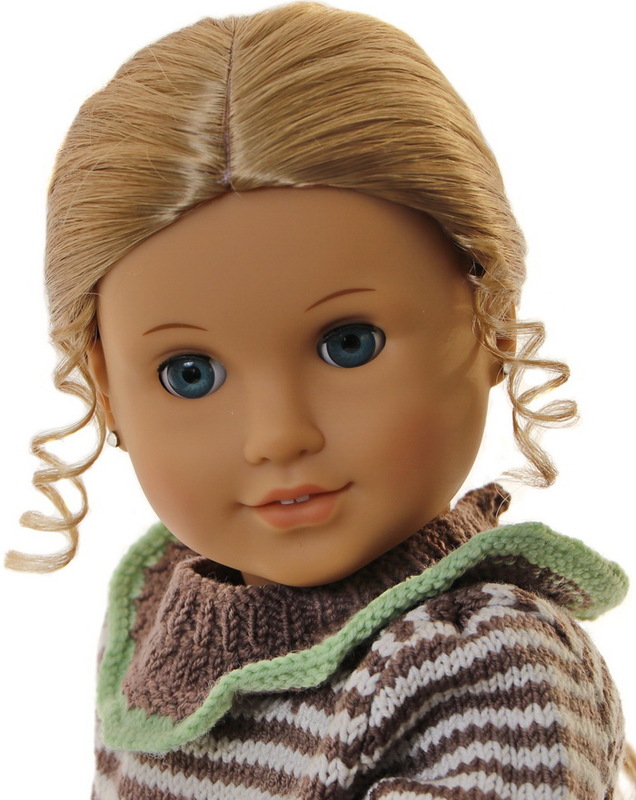 The sweater has small green wrinkled edges around the arms and around the edge. Around the waist it has a row of eyelets knitted in brown. Since the sweater has these small green edges I thought that a chord bound together in a bow around the waist in green would look nice. The sweater is buttoned at the top back with a little button. From the ridge along the neckband I have knitted up sts for a little collar. 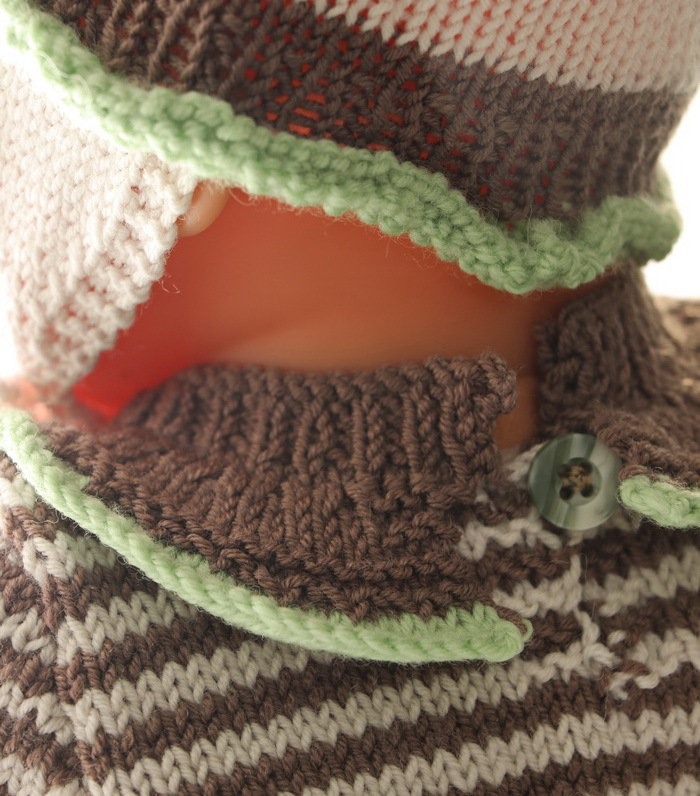 The collar is knitted in brown and at last around the edge it has a green wrinkled edge. Cast on 210 sts in green and knit 2 rows ga. On next row decrease every 3rd sts = 140 sts in total. Knit 1 row. Change to brown and knit 1 row. Then knit 5 rows rib, k1, p1 across rows. Continue knitting st st knitting 2 rows brown, 2 rows beige alternatively across row until work measures approx. 6 cm. End work here knitting 1 row in brown. Next row decrease every 7th sts = 120 sts in total. 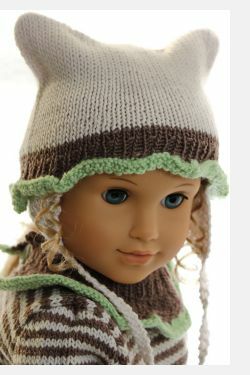 On next row knit a row of eyelets like this: K2tog, yon alternatively across row. Continue knitting 2 rows st st before knitting stripes, 2 rows beige, 2 rows brown alternatively until work measures 10 cm. On next row cast off for the armholes like this: Cast off 3 sts, k54, cast off 6 sts, k54, cast off 3 sts. Continue knitting front and back separately. Front: : Continue knitting st st in stripes and at the same time cast of 1 sts at each side every second row 7 times altog = 40 sts left on row. Continue knitting st st and stripes until work measures 17.5 cm. On the next row cast off the 16 center sts and knit each side separately. Continue decreasing 1 sts along the neckline every second row twice. Knit 3 rows st st and put shoulder sts on a cable ndl. 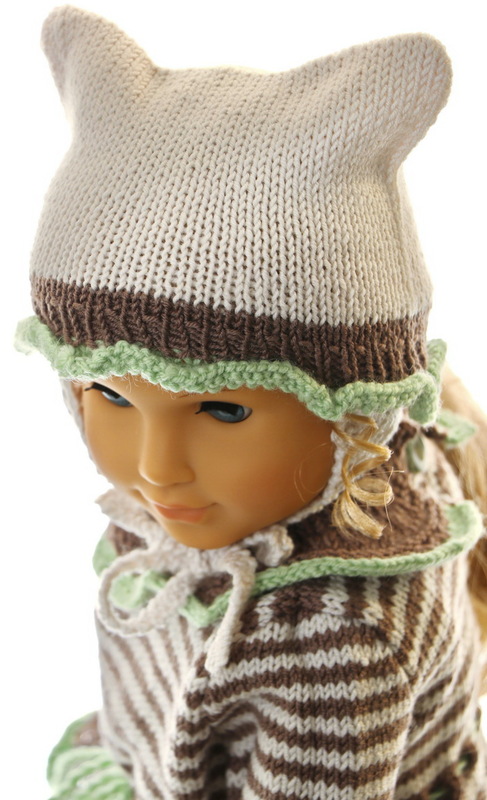 The cap is knitted with the same edge in green and it has warm earflaps. 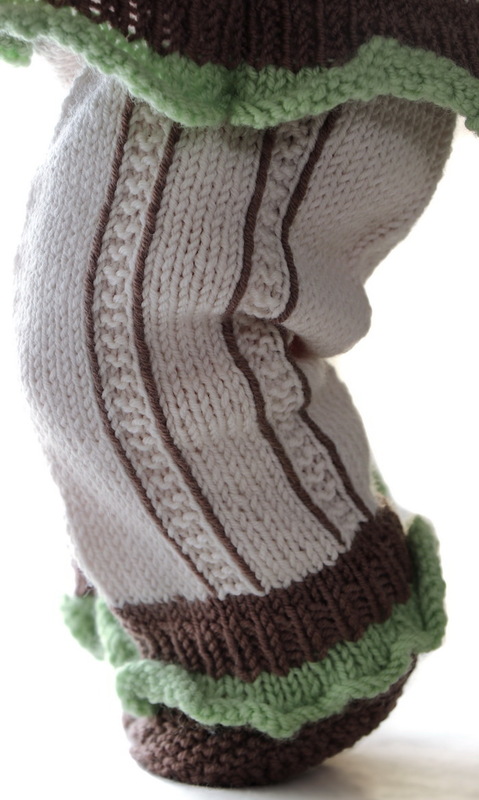 The earflaps are hold together with 2 chords knitted in garter sts. The cap was lovely together with the sweater. The pants are knitted in beige. 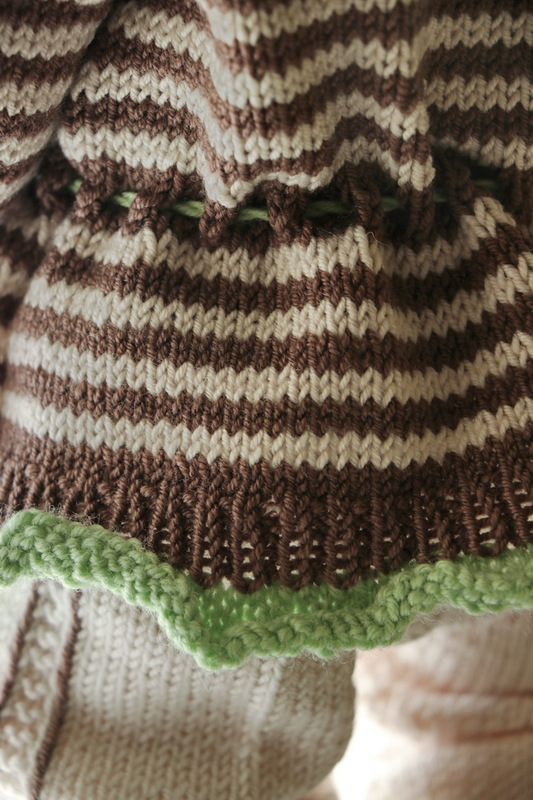 It has sewed stripes in brown backstitches along the stripes knitted in garter stitch stripes along the legs. It has suspenders and are buttoned front. Cast on 100 sts in green and knit 2 rows st st. Next row: K2tog across row = 50 sts on row. Purl next row. Change to brown and knit 1 row st st, 5 rows k1, p1 alternatively across rows. Continue knitting 2 rows st st inside 2 sts at each side knitted in ga = edge sts. Change to beige and knit st st and edge sts 1 row. From the WS knit 2 rows in ga along the center of work like this: K2 edge sts. P18, k2, p6, k2, p18, 2 edge sts. Continue knitting these 2 rows along the legs until work measures 9 cm for American Girl doll, (7 cm for Baby born). Continue knitting st st with edge sts and stripes in ga and at the same time increase 1 sts at each side every 4th row 5 times altog. = 60 sts on row. 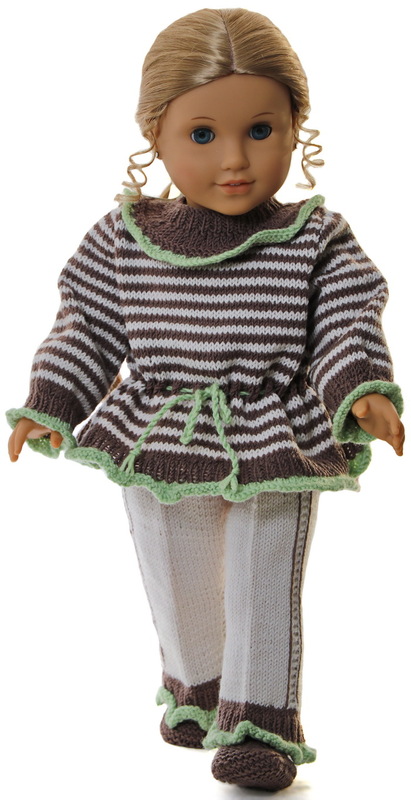 When work measures 15 cm for American Girl doll, (13 cm for Baby born put work aside and knit the other leg in the same way. ... of your doll dressed in this gorgeous outfit.